TheJournal.ie understands that Bulmers’ commercial team may be halved after C&C’s acquisition of the Gleesons Group. 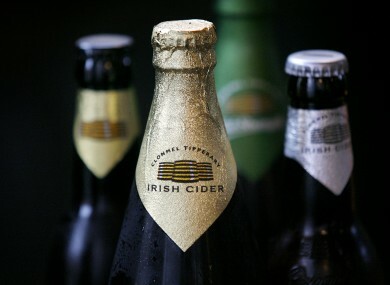 UP TO 35 JOBS are set to be lost at cider company Bulmers following an internal reorganisation, TheJournal.ie has learned. The jobs will be lost due to a restructuring of Bulmers’ commercial team after its parent company, C&C Group, purchased the Gleesons Group, another drinks manufacturer based in Bulmers’ native Tipperary. The €12.4 million purchase – which boosted C&C’s Irish workforce from over 200 to nearly 800 – will see Bulmers’ commercial team integrated with that of the Gleesons Group, which markets soft drinks including Finches, Country Spring, Cadet and Score, as well as Bavaria beer. A spokesman for the C&C Group confirmed that the Bulmers commercial team, of over 70 people, would be transferred to Gleesons from June 28. While the group said it could not confirm the number of redundancies as a result of the transfer – as it will first enter a period of consultation with the employees effected – it is believed that the final number will be just over 30. “The integration is necessary to safeguard and protect as many jobs as possible in the enlarged group following the acquisition of Gleesons, which has more than trebled C&C’s workforce in Ireland,” the spokesman said. The Bulmers staff involved in the arrangement were informed of the transfer on Wednesday. The C&C Group spokesman said Bulmers’ Clonmel operation remained a “key manufacturing asset” of the group – and that speculation that the manufacturing base there could be closed was “absolutely not the case”. The internal reorganisation affects only commercial staff, and does not involve any manufacturing staff from the Bulmers company. Email “Up to 35 jobs to go at Bulmers following merger with drinks group”. Feedback on “Up to 35 jobs to go at Bulmers following merger with drinks group”.